You know how important it is to take care of your own health. You as the youngest of your family knows what you want achieve in your life. 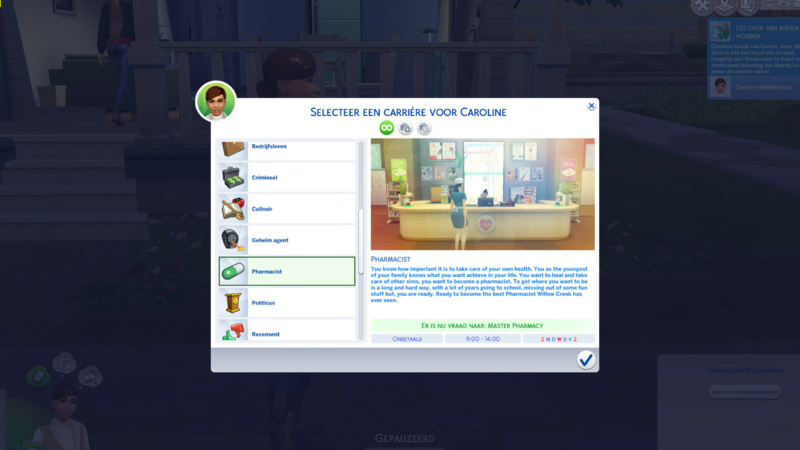 You want to heal and take care of other sims, you want to become a pharmacist. To get where you want to be is a long and hard way, with a lot of years going to school, missing out of some fun stuff but, you are ready. Ready to become the best Pharmacist Willow Creek has ever seen. You are in your last year of uni and you almost reached the finish line. In the last few days of school you have a lot tests you need to study for but, you also need to visit a few pharmacy shops to leave your resume behind for your internship. You leave every store with a big smile on your face, they say a smile is your business card to success. As an intern working in a real pharmacy you will learn the basics from the specialists. You basically learn everything you need to know about pharmacy from them. A Pharmacist needs to know every medicine, ointment and drops by memory. Everytime you learn a new medicine, you write down all the names, descriptions and side effects in your notepad. You might not have noticed it but, one of the specialist went to your boss and told him about the way you work in the pharmacy and that he should consider offering you a job here. At the end of your internship you get called to your bosses office, with cramps in your stomach you walk to the office. As you were about to knock the door, the door swings open and your professor walks out. What was he doing here? There was no time to ask because your boss was clearly excited to tell you about the big news. As you get home from your last day, you plop down on your couch with the biggest smile on your face. Your boss and professor offered you a special Health and Care program, with this program you get to travel abroad and attend different fairs to learn even more about medicines. After 6 months of traveling and visiting a lot of fairs, you finally are home again. Even a few days later you find yourself sitting in your bosses office, staring at the papers laying in front of you. As you read the small letters, you sign without hesitation. Your boss shakes your hand and congratulate you on landing the job. As usual you will be working in the store but, once in a while you need to drop of medicine at customers houses, the hospitals and other local pharmacies. You already experienced how it is to deliver medicine to customers and hospitals. The hospital, were you daily deliver medicine were highly impressed by the way you easily teached their staff about the medicine. They contacted your boss and asked him if they could hire you to not only manage their staff but also teach their interns all about medicine. You accepted their offer and can’t wait to start teaching new blood about all the things you know. After a few weeks of teaching and manage a big group of hospital staff: it is time to say goodbye and return to the pharmacy. Unfortunately, the hospital is not ready to let you go yet. So, they offer you even a better job. They are sending you to their lab to especially work with specialist who are working on new medicine. All you need to do is: learn, study, research and see how the professionals are doing it. You did it! You did what most simmers couldn’t do: achieve their dream to come the best Pharmacist Willow Creek has ever seen. You can not be any prouder of yourself than you already are: you never stopped learning, teaching others and crafting new medicine and you still show up to work with a big smile on your face. Finally, it is time for you to experiment with liquid fluids, powders and bacteria. In your free time or even during work you research a lot about new fluids, powders and dangerous bacteria: you want to learn as much as you can to bring a new medicine on the market. As the finish product is done you need to send it to other labs so they can test it before a sim gets their hands on them: you don’t want to start a chaos. You have come a long way, from an Intern working in a local pharmacy to Head Pharmacy Manager developing new medicine to cure sims. Right now, you are sitting in your old bosses office waiting for whatever he wanted to tell you. He wants you to take over the pharmacy: you are smiling from ear to ear and you gladly accepts his offer. He knows his store is in good hands and you will not disappoint him. The new medicine, you and your team have been making has been tested and is ready to be introduced to the world. Well, not yet because you need to promote the product to other pharmacies and which way is better than the old fashioned way: by visiting each pharmacy, present the new medicine, leave a pamphlet and of course leave the store with a smile and before you even know it every store is ordering your medicine.